Health and safety in the workplace isn’t just a box to be ticked to meet a compliance standard. Workplace Health and Safety (WHS) policies are crucial for protecting not only your staff, but your company’s reputation and the costly disruptions that can occur because of a major accident. Electrical hazards pose one of the most dangerous risks to the harmony of your workplace. Thankfully, however, they are also the easiest to prevent if you stay proactive and take the right action. An electrical hazard refers to any cable, device or area in your workplace that is at risk of causing injury, shock or even death because of an electrical current. This can be caused due to contact with exposed wires or a fire or explosion where electricity was the source of ignition. Some workplaces are more prone to danger from electrical currents than others, particularly those in harsher weather conditions. If your office is outdoors, in industries like construction or landscaping, the risks posed by water on equipment are high. Similarly, those that operate heavy machinery will need to pay careful attention to their safety procedures. Electrical safety in the workplace is important no matter what industry you’re in. You have a duty of care to your staff and your company to protect against electrical faults happening can causing harm. The best thing you can do to fulfil this obligation and keep the costs from disruption down is being proactive with your approach. Here is a list of the most common electrical hazards that are faced in the workplace, along with simple steps you can take to avoid them before they impact your business. One of the biggest culprits for electrical injuries at work is employees attempting to repair or fix up electrical items themselves. You can reduce the risk of this happening by telling your staff to report all potentially damaged items immediately. Then, call in a licensed or registered electrician to carry out any of the required work. Power sockets are a big cause of electrical hazards and safety problems. Too many workplaces don’t keep an eye on the number of power sockets available for staff equipment. This ends up in existing sockets being piled up with overwhelming loads, which can cause electrical fires very quickly. Stop this happening by ensuring there are enough power sockets for the equipment in each room, and installing new ones as soon as the need arises. It can be tempting to chain extension cables together to reach longer distances, but this practice rings with warning bells. This contributes to overloading sockets and can create sparks and other dangerous situations. If you see this being done, disconnect immediately and contact an electrician to sort out some new sockets. Everyone knows this is can be a potential risk to safety, but it’s still far too common in offices. Running cords through high-traffic areas is a tripping hazard. It can also cause exposed wires and damaged sockets. If you need to run a cable, use a cord runner or electrical tape for protection. Staff can get creative when they need a quick solution. One such example is fastening down electrical cables using staplers, securing them on a wall with nails, suspending them from a wire or hiding them with mats or rugs. You can expose wires and create damage if anything is pulled on, and the result could be a painful shock. It might be convenient but pulling a cord from a socket without gripping the plug itself is not recommended. By yanking from a position far up on the cable, you’re risking damage to the cord which can result in exposed wires. This really can happen, and it can cause an enormous and potentially fatal shock if you get contact with that wire. Include this in your safety training to tell your staff it’s not ok.
Damaged electrical appliances can wreak havoc in the workplace, causing fires, shocks and blackouts that can quickly become fatal. 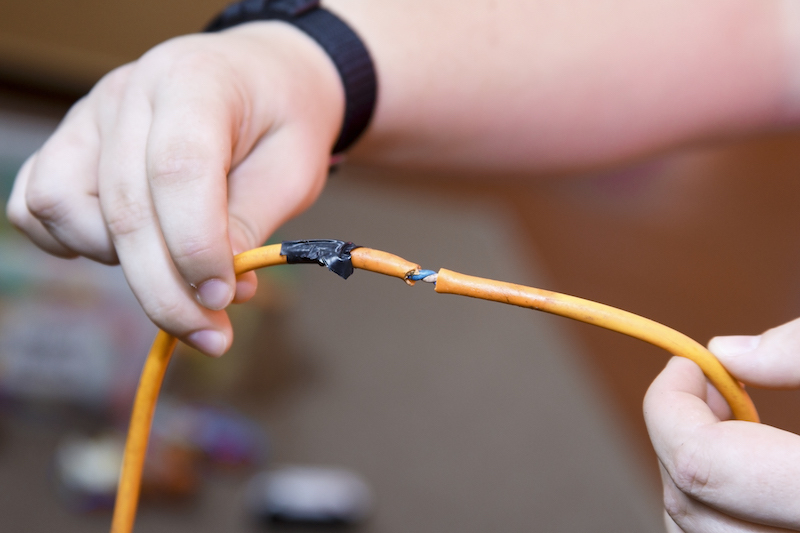 It’s a good idea to inspect items and cords regularly, looking for frayed edges, cracked parts or similar damage. If something has a strange smell or noise, it could be a hazard and it’s worth investigating further. A great way to manage the status and safety of your electrical items without the constant attention is getting your appliances tested & tagged regularly from a licensed safety company. Electrical hazards in the workplace don’t have to cause trouble. By keeping an eye out for the issues above, you can prevent a fatal accident and insure your company against the financial losses it can incur from any disruptions to service. Finally, you can ensure your company doesn’t become an unwanted feature story on the 6 o’clock news.